Tagaytay City is always one of the top choices when it comes to road trips and quick weekend getaways, especially for those coming from the metro. In just one to two hours, the refreshing ambiance, stunning sceneries, and endless food options await you. #1 - Antonio's Restaurant: Celebrate life's special moments in this classic fine-dining restaurant that features the best of international cuisine from Chef Tony Boy Escalante. Its excellent food, elegant decors, lovely gardens, and great service are what makes it exceptional. Take note that this restaurant is strictly by reservation only and the menu is quite pricey. But then again, spoiling yourself and your loved ones here is very much worth it. #2 - Balinsasayaw: Get yourselves ready for some boodle fights in this restaurant that serves traditional Filipino dishes. 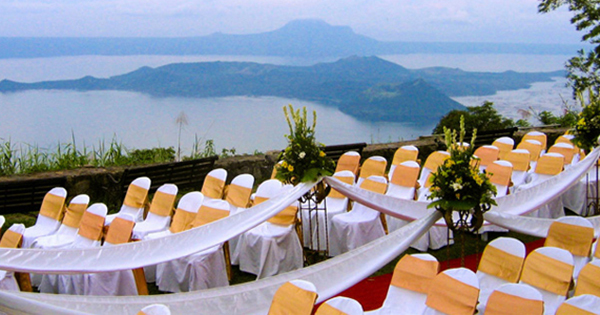 Located along Aguinaldo Highway, Balinsasayaw has separate al fresco huts that is overlooking the Taal Lake. Their packages and bilao sets are highly recommended for large groups but they also serve ala carte meals such as barbecue, lechon kawali, sizzling sisig, and practically any Filipino dish you can think of! #3 - Cafe Voi La: Not your typical cafe, Cafe Voi La don't just serve basic sandwiches and coffee, but the best of Asian fusion cuisine. Though it sounds French, its name actually came from the Vietnamese word "boi la" which means "to boil with leaves". Tucked away inside Crosswinds Resort Suites in Tagaytay, this cafe is Instagram-worthy from every angle with its adorable Asian ornaments, and oriental displays and furniture. #4 - Lime and Basil Thai Restaurant: Taste the goodness of Thai food in this restaurant that serves farm-to-table authentic Thai cuisine. Their dishes, most especially Pad Thai, claim to be the most authentic tasting of all outside Thailand. They do not only consider the taste but they paid attention to the presentation also. The dining experience doesn't end there as they also house a craft store and a garden where they grow their own edible herbs and flowers. #5 - Bag of Beans: Don't you just love a lovely atmosphere while holding a great cup of brewed coffee on your hands? With 18 years, 6 branches and counting, this cafe and restaurant proves to be the best for that. It is definitely the perfect place for hanging out with their cozy and vibrant ambiance. They also specialize in homemade savory pies, breads, house blend coffee, and they serve ala carte meals and brunch buffets as well. #6 - Sonya's Garden Restaurant: Enjoy nature's beauty while sipping your cup of tea in this restaurant that offers all-day buffet meals inside their greenhouse-like dining area. Their wide variety of menu includes breads, pasta, steaks, desserts, salads and even edible flowers freshly picked from their garden! If you can't get enough of Sonya's, they also have a spa and bed & breakfast cottages where you can fully take pleasure in the serenity of nature. #7 - Concha's Garden Cafe: Feast your eyes on the breathtaking view of Taal in this restaurant's deck overlooking Taal Lake and then have a feast with their sumptuous local favorites. It is great catching up with family and friends in this lush garden-themed restaurant that serves Filipino dishes such as okoy, bulalo, lechon belly, among others. With recipes handed down within the family, expect a unique burst of flavors and love. #8 - Chateau Hestia Garden Restaurant: One of Tagaytay's best kept secrets, this restaurant set in a half-hectare property surrounded by lush greens will surely give you a homey relaxing feeling. They serve authentic European cuisine and you can opt for their monthly set menu or ala carte meals. Named after the Greek goddess of fire, Hestia, they also guarantee guests that the experience will never die out.